This version of Chile Rellenos is roasted and stuffed, not deep-fried, making it a wholesome – and wonderful for a weeknight dinner. 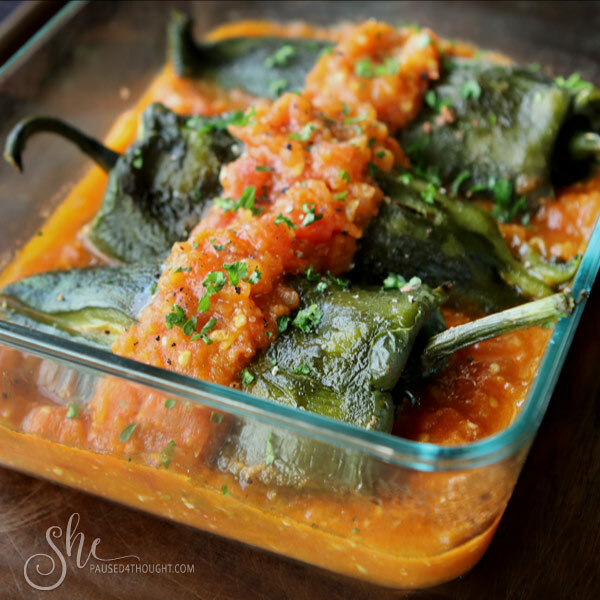 This recipe for Poblano Stuffed Chilies is just one of the delightful recipes from Chef Geraldine Gilliland’s cookbook, The Lula Cocina Cookbook; My Favorite Recipes from Mexico to Malibu. Chef Geraldine is a vivacious soul who is passionate about food and rescuing dogs. 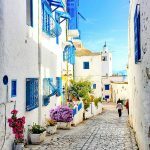 She has vast experience in classical French cuisine, and has worked with distinguished chefs of every nationality, which has given her profound experience in ethnic cooking. Her love for dogs has led her to create Chiquita’s Friends a 501(c)3 she founded to help abused, neglected and abandoned dogs. And, all proceeds from her book go to Chiquita’s Friends. Chef Geraldine is someone who truly combines her passion with her convictions. 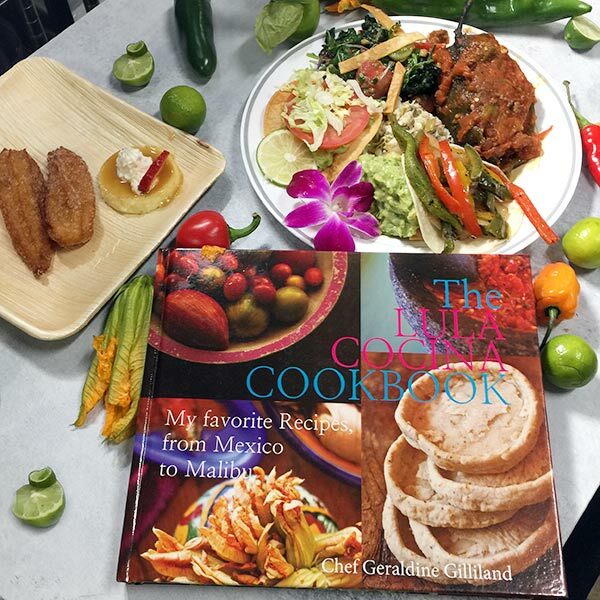 In The Lula Cocina Cookbook, Chef Geraldine shares her favorite Mexican and Malibu-ite recipes, which range from Lobster Taquitos to Vegan Arugula, Kale and Quinoa Salad. She gives you tips and tricks, and shows you how you can put your own spin on them to create your own signature dish. 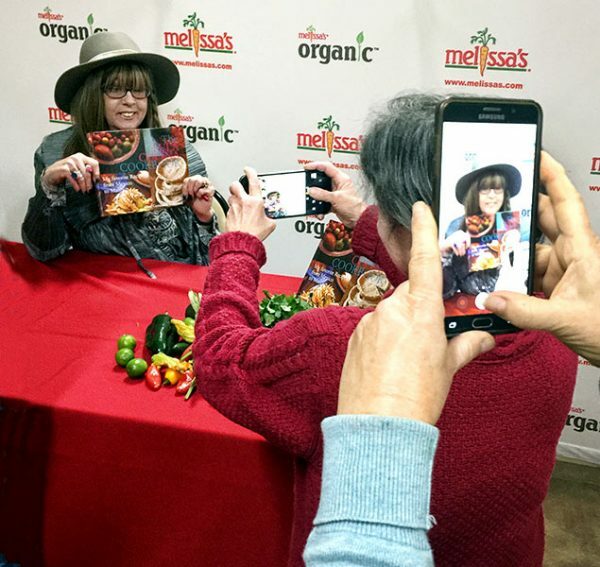 I recently tasted some of Chef Geraldine’s flavorful dishes at a media event at Melissa’s Produce. You can also enjoy her food at her Santa Monica restaurant Lula Cocina Mexicana. This is one of Chef Geraldine’s favorite cold appetizers. It is light yet sumptuous and simple, making it a perfect lunch treat. 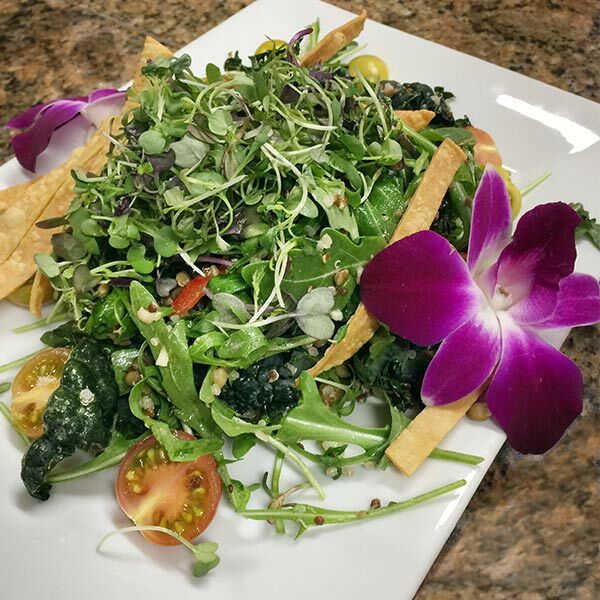 Chef Geraldine demonstrated her colorful Arugula, Kale Quinoa Salad with Agave-Lime Vinaigrette gorgeously decorated with orchid flowers. Note: The blooms of all orchids are considered safe for consumption, but some species can irritate the stomach. Not only are they beautiful, but they reportedly give off a flavor similar to leafy vegetables, such as endive or watercress. 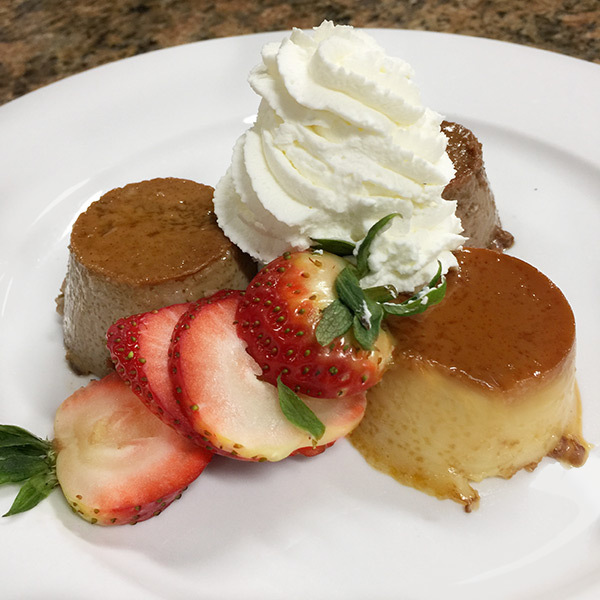 We also enjoyed a demonstration on how to make flan, which Chef Geraldine presents three recipes in her cookbook, flavored with vanilla, ginger or coconut. The Lula Cocina Cookbook is full of great recipes and does so much good for our furry pals at Chiquita’s Friends. Within all this delectable bounty, my favorite recipe of the day was the Poblano Stuffed Chilies. 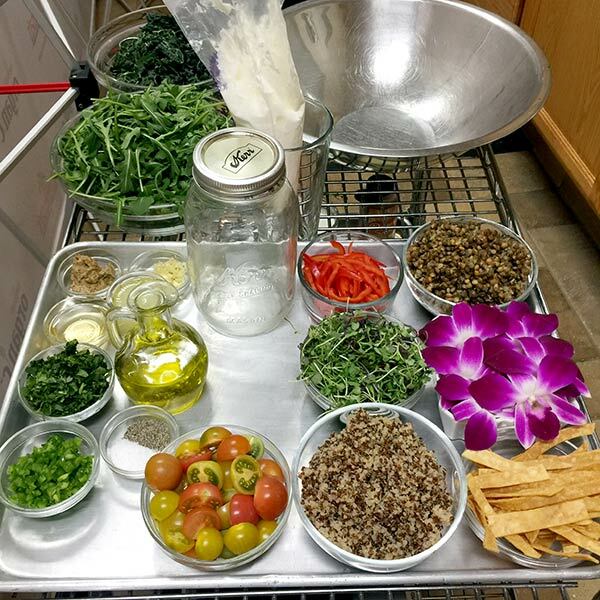 The ingredients are easy to find and the process, while somewhat time consuming, is well worth the investment. The meat filling is also great for tacos, taquitos, or in queso fundido. I used 2 smaller pans to snuggle in the chilies. I baked one and kept the other in the refrigerator to cook later, though you could also freeze it. These Poblano Stuffed Chilies are roasted and stuffed, not deep-fried, making it a wholesome – and easy enough for a weeknight dinner. Roast the chiles over an open fire, place in a plastic bag, and allow to steam for 10 minutes. Peel off the charred skin and carefully make a slit down one side of each chile. Extract the seeds and the ribs. Place on paper towels to dry out. Heat olive oil in a saute pan and add the onion and garlic and saute until translucent. Add the ground beef and saute to take the rawness off the meat. Add the rest of the ingredients and cook down until well incorporated. Season with salt and pepper, and set aside to cool. Stuff each chile with a generous amount of meat stuffing. Pour 2 cups of the tomato sauce into an 11 x 8-inch baking dish (I used 2 smaller dishes) that will fit the chiles snugly. Place them opening side down, in the baking dish. Cover tightly with aluminum foil and bake at 325 degrees F for 20-25 minutes. Optional: Drizzle sour cream over the chiles in the dish. Serve with extra Fresh Tomato Sauce on the side. Put tomatoes in a pan with the jalapenos, cover with water, and bring to a simmer. Cook at a fast simmer until fairly soft, but not falling apart. This takes about 10 minutes. Put the jalapenos, garlic and a little of the cooking water into a blender and blend well, until broken up. Add the tomatoes and blend. The sauce should have a slightly rough texture. Heat the oil in a large saute pan over high heat and add the sauce. NOTE: When you add the sauce to the oil in the pan, be careful as it will sputter as you don’t want to burn yourself. Cook, stirring all the time and scraping the bottom of the pan, until reduced and the raw taste of garlic has disappeared about 5-6 minutes. Add salt to taste. For a vegetarian version, stuff the chiles with Jack cheese or a mixture of goat cheese, spinach, and pine nuts. 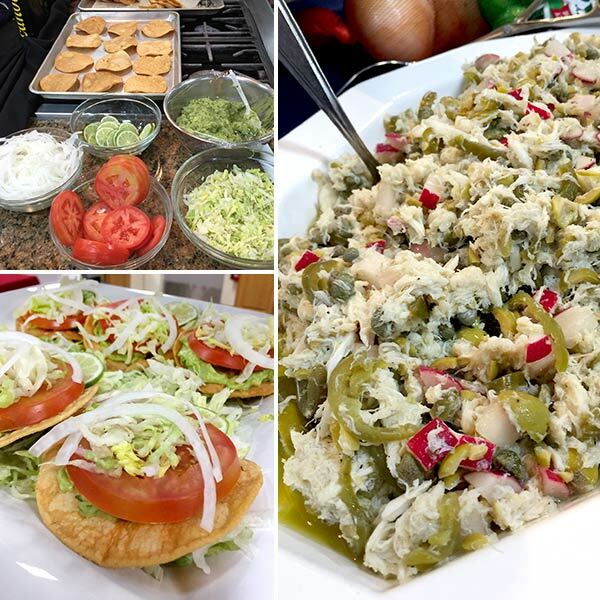 If you love Mexican food, check out The Lula Cocina Cookbook. If you have a heart for rescuing dogs check out this video. Either one will warm your heart and soul stomach. Disclaimer: I received a copy of The Lula Cocina Cookbook to review. All opinions are my own. 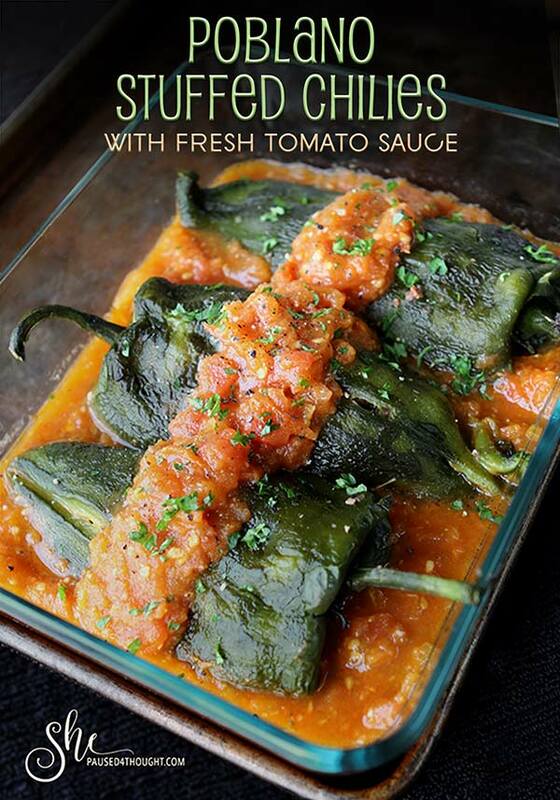 Cathy, these Stuffed Poblano Chiles were so good, I had to make them asap. I made them myself a couple nights ago and we’re having the leftovers I hid from my husband tonight. Yum. Yum. Thanks Patricia! I really enjoyed them as well. Do you think it would be o.k. minus the cinnamon and raisons? Sweet stuff… ? I cut the cinnamon in half and would definitely keep the raisons. Great balance of flavors. Thanks for the catch! I will change it now. Not sure what I love more, her beautiful food, or her love and care for dogs. Your stuffed chilies are gorgeous and I’m sure super delicious! Thanks Valentina! They were a popular favorite at Melissa’s Produce and my guests at home. Sound and look absolutely wonderful, Cathy! I’m really missing out on so much by not going to Melissa’s events! Wish I had 48 hour days! Me too. Such great events and wonderful food! These stuffed peppers look so darn good! I’ve never heard of this chef. Thanks for sharing her cookbook. I totally respect her work for animals. Very cool. Thanks Chef Mimi! She is a very compassionate and talented lady! I know I would enjoy all of her dishes and especially the stuffed poblano peppers. Thanks Karen, everything I tasted was so delicious.